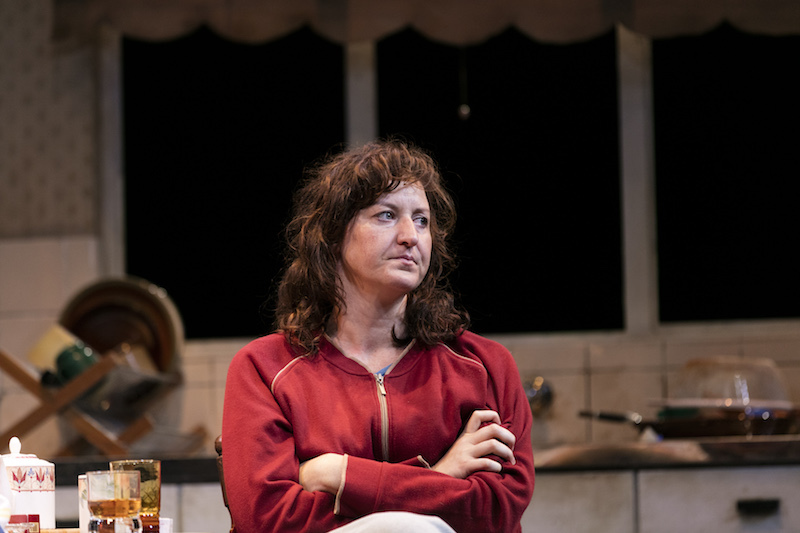 A dazzling production of a pioneering 1980s play that still feels painfully relevant. Most of us have had that conversation about who you would invite to your ultimate, fantasy dinner party. Caryl Churchill’s famous 1982 play Top Girls begins in that vein in brilliant fashion. Marlene (Helen Thomson, in a blue suit with 1980s padded shoulders) has just been promoted to Managing Director of a London employment agency, and has invited a group of extraordinary, pioneering women from across history to a restaurant to help her celebrate. There’s Pope Joan (Heather Mitchell), who may or may not have been pontiff in the Middle Ages, having disguised herself as a male from age 12 and risen through the ranks of church, only to be undone by childbirth. Other guests include Victorian explorer Isabella Bird (Kate Box), Lady Nijo (Michelle Lim Davidson), a 13th century Japanese geisha who bore children to the Emperor before becoming a nun, Dull Gret (Contessa Treffone) who featured in a painting by Breughel leading armed peasant women into hell, and Patient Griselda (Paula Arundell), whose loyalty was cruelly tested by her husband in a story told in Chaucer’s The Canterbury Tales. As the conversation flows with the Frascati, we hear the stories of these fierce, opinionated women and the compromises they had to make, along with the awful things they endured at the hands of men. Yet they are strong, resilient and unbowed. Pope Joan may have come to a terrible end but she maintains a ribald sense of humour, Isabella Bird and Lady Nijo both love to talk, while Gret says little for most of the night as she eats voraciously and tips food and bottles of wine from the table into her basket. It’s a sensational, witty opening to a play about women and the choices they must make to succeed in a man’s world. A pioneer herself, Churchill uses overlapping dialogue in the dinner party scene as the women talk volubly, frequently over each other. Directing the play for Sydney Theatre Company, Imara Savage handles this challenge exceptionally well, allowing the cacophony to build but then focussing our attention where it needs to be so that important information isn’t lost. 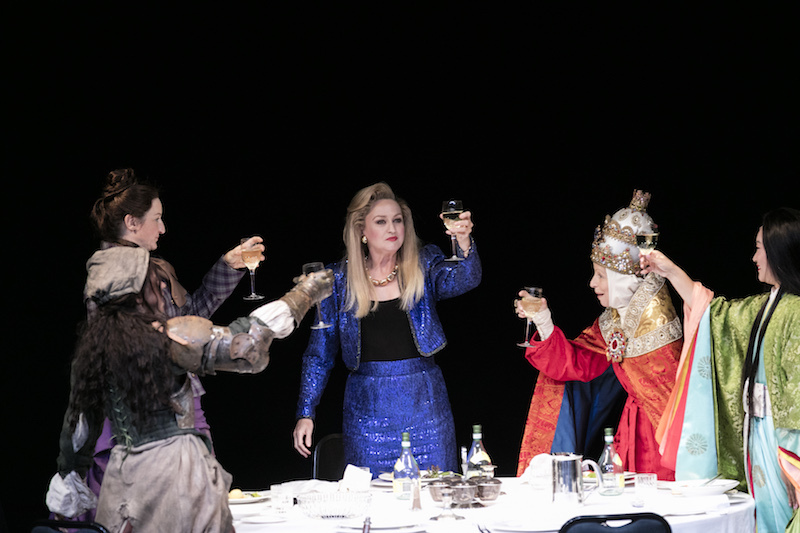 After the fantasy opening, the superb, all-female play returns to its 1980s setting in Thatcher’s England: a time when the “Iron Lady” – who famously said that “there is no such thing as society” – was pushing an individualistic brand of capitalism. As the drama changes gear and tone, we are in the Top Girls employment agency, with Marlene interviewing a job-seeker and condescendingly pushing her towards a job she isn’t really interested in. In the second act, we meet the troubled, aggressive, unhappy Angie (Treffone) who is 16 but immature for her years. Hiding in the garden with her 12-year old friend Kit (Claire Lovering), she threatens to kill her mother Joyce (Box) who we see through the kitchen window. In another scene at the employment agency, we encounter women such as Louise (subtly but heart-wrenchingly played by Mitchell), who has devoted her life to her company only to watch less experienced and less talented young men promoted over her, and the seemingly super-qualified, confident Shona (Lovering) who Marlene quickly realises is making up her c.v. as she goes. As the play unfolds it becomes gradually more realistic, ending with a heart-stopping scene, set a year or so earlier, in which Marlene and Joyce confront each other in the shabby kitchen of the council house where Joyce has been bringing up Angie. While Marlene has escaped their working-class upbringing, her sister Joyce remains trapped in a life of drudgery, working several jobs as a cleaner to make ends meet. And life certainly isn’t looking any brighter for her under Thatcher. As their argument rages over family, choices made, class and social injustice, we discover exactly what Marlene has willingly traded for her success, and the sacrifices made by Joyce. Thomson and Box are both superb, the scene full of such blistering, raw emotion that you could feel the audience holding its breath as one. It is a punch to the solar plexus, a shredding of the heart, devastatingly brilliant theatre. Savage has cast the play immaculately. Each actor gives a finely observed, riveting performance, and they work together as a tight ensemble. The final scene between Thomson and Box, though, is unforgettable. David Fleischer’s set captures the play’s progressive realism. It opens on a huge open black box stage with a ceiling of glittering silvery fronds. The restaurant table is then placed centre stage. The stylised office is all clean, hard lines with chunky computers (how well I remember them!) on white desks, while for the final scene the kitchen is full of such detail that we know exactly the kind of down-at-heel house that it is. Damien Cooper’s lighting creates just the right level of warmth and stylisation within each scene and Renée Mulder’s costumes add plenty of vibrant colour and character, while speaking to the period. Scene changes are punctuated with snap black-outs and blasts of the Rolling Stones’ Sympathy for the Devil, which somehow matches the punch of the play. All in all, this is a dazzling production that leaves you all-too-painfully aware of how strongly the issues in it still resonate more than three decades on, while the devastating emotion of the final scene is hard to shake. Unmissable. A magical piece of storytelling that holds you spellbound from start to finish. British director John Tiffany explains the genesis of a hit show and how Aussie actors are making it theirs.